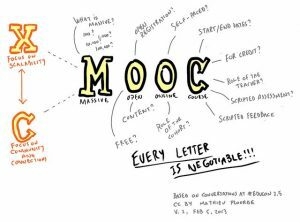 The acronym MOOC means Massive Open Online Course. However, there is not one single interpretation of each of these terms and, therefore, the phrase has been used to describe different types of learning experiences. In particular, and as outlined at the start this module, the meaning of the word ‘Open’ has proved to be rather contentious. MOOCs arguably became mainstream in 2012, although there were instances of online courses open to anyone and involving large numbers of learners before then (Davidson 2013). Whilst 2012 was named as ‘the Year of the MOOC’ by the New York Times (Pappano 2012), when four major providers of MOOCs were founded or announced – Coursera, edX, Udacity and Futurelearn –, the term MOOC was coined a few years before that, in 2008 after a course on connectivism ran by George Siemens and Stephen Downes: Connectivism and Connected Knowledge (CCK08). Courses following a model similar to the approach adopted by CCK08 are often referred as ‘connectivist’ MOOCs, or cMOOCs. While cMOOCs take place across distributed platforms (for example, blogs, social media), xMOOCs are typically confined to a single learning management system through which content is made available to participants and where all interactions take place. Coursera, edX, FutureLearn or Udacity all have their own platforms that universities offering courses through them are required to use for the delivery. Further, xMOOC platforms are generally run as commercial enterprises and this may have an impact on what content can be used on the platform. Another important difference between cMOOCs and xMOOCs is that the former tend to focus on interactions, while the latter usually prioritise the delivery of content to students. Also, xMOOCs tend to incorporate some formal assessment that can lead to some form of certification, often subject to the payment of some fees. An important difference between MOOCs and some of the open courses available at platforms discussed in section 2 is that MOOCs are usually delivered to cohorts of learners who start a given course together at specific times. Therefore, interactions, assignments and assessment only take place within a bounded period of time. However, learners might start at any point on the courses offered by initiatives such as OpenLearn or Saylor Academy. A more detailed comparison of the main differences between xMOOCs and cMOOCs from a pedagogical design dimension can be found in the Bates (2015). In the Arab-speaking world, as featured in the OpenMed Compendium, Edraak has become the main MOOCs provider, following the xMOOC approach. Universities in the South-Mediterranean region have also launched MOOCs making use of their own learning management platforms (for example, Moodle) as exemplified by Discover Palestine. For further details on these initiatives consult the case studies on Edraak, Discover Palestine and UC@MOOC included in the OpenMed Compendium. The open nature of MOOCs has been heavily questioned since the explosion of their popularity in 2012. MOOCs are open because anyone with access to the internet is able to enrol for free. However, not all MOOCs apply open licenses, so they cannot be considered open in the same sense as OER are open in compliance with the 5R rights. Indeed, the content of courses delivered by most prominent MOOCs platforms tends to be protected by full copyright. For instance, Coursera allows users to download content for personal use, but it is not possible to reuse, modify or share the content, so opportunities for lecturers to make use of this as part of their teaching are rather limited. edX restricts by default the ability of users to reuse content, although its terms of service state the intention of increasing the use of open licenses. In the case of FutureLearn, all rights protection is also the default, but it is up to course providers to decide under which conditions they want to make content available. Most xMOOC platforms now offer the option for learners to get some sort of certification evidencing their achievement. To be eligible to get a certificate, learners usually need to go through some sort of formal assessment process after completing a course and achieve a minimum required score. Formative assessment (i.e. exercises counting towards the final mark) in these platforms usually takes the form of multiple choice tests. Some xMOOCs also include peer-review as part of the assessment. Some platforms offer different kinds of certification, depending on the mechanisms in place to verify the identity of candidates or the grades. While free enrolment is one of the defining characteristics of MOOCs, most xMOOC platforms have now implemented revenue generation strategies that involve paying a fee for certifications as well as a wider catalogue of paid services, namely longer degrees leading to more formal qualifications. Coursera, edX and Futurelearn have also expanded their offering of paid services by means of course bundles that allow learners to get qualifications and even full degrees. One of the main concerns about learning in MOOCs is the high level of attrition. Namely, according to a study analysing data on 221 MOOCs ‘Completion rates (defined as the percentage of enrolled students who completed the course) vary from 0.7% to 52.1%, with a median value of 12.6%’ (Jordan 2015). The study also reported that enrolments on MOOCs have overall declined while completion rates have improved over time since the launch of major platform providers in 2012. It is worth stressing that dropout rates have typically been much higher in e-learning and distance education than in campus-based courses. Also, while still an important indicator of engagement, it is important to understand the value of this metric in relation to MOOCs as opposed to formal education courses. The main reason for that is that learners taking a MOOC might not be interested in formal recognitions, or be driven by any motivation other than just learning, which can still happen despite not engaging in assessment. On the contrary, students enrolled in formal education programmes are presumably driven more strongly by the extrinsic motivation of getting the credentials associated with completing a degree. 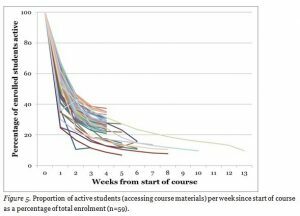 Based on the analysis of a subset of MOOCs, the study mentioned above concluded that the first two weeks of a course are critical for student engagement and assessment submissions. Other relevant findings of the study indicate that automated assessment has a positive impact on completion rates (as compared to peer-grading or a mix of both approaches) and that the shorter a MOOC is, the higher the chances of learners finishing. These conclusions have implications for those interested in designing a MOOC. The formation of local learning communities articulated around particular MOOCs might also offer another way of improving engagement, as suggested by research on the motivations behind learners who had the initiative to arrange face-to-face meetings with peers. This kind of experience might fill an important gap for students who believe that not all learning can take place in an online setting. Despite the overall difficulties in reusing the content of MOOCs as OER, due to the limited use of open licences, there are ways in which this type of course can be of help to lecturers and students in higher education settings, whether it is in connection with the formal curriculum or not. Aiming to foster the creation of local learning communities around MOOCs, the Peer 2 Peer University has developed a methodology and training materials for anyone willing to facilitate what they call a ‘learning circle.’ Moreover, they have launched a platform to publicise learning circles in any city, so learners with similar interests can easily get in touch.